Whenever this topic comes up, there are always some interesting discussions to help explain how and why things like diversity residencies and temporary jobs are okay. More than okay, beneficial to new career folks, even. They can provide experience with pay. They expose early career professionals to new and different types of work. They help to diversify the profession. That last one is totally not true because our profession has been holding steady at 85+% white for the last several decades despite all the programs. So my question—to all the folks who proudly tout these precarious temp appointments—is: Why? Why is it so important to have and maintain these precarious positions? Why are your institutions so excited to spend money year after year on a different set of POC to do the work that a more permanent staff member could do? Why are you so willing to welcome POC into your temp positions for a year or two or even four, but you don’t want to invest in keeping us for the long haul? Why do you parade us before your search committees, like many of our ancestors on the auction block, year after year after year for short-term appointments; yet fill your tenure-track lines and full-time, long-term positions with the same young, white, female faces? Why is it okay to help “diversify” the profession within your institution for a little while but not for the course of our careers? I’ve seen the job postings for many of your positions that you claim require “3-5 years of experience.” Hell, I’ve served on search committees for them. Very often, those jobs don’t require 3-5 years or even any experience. A talented and hardworking POC new to the profession could learn what they need to do within the context of your unique institution (that institutional learning curve is always significant no matter your experience). They could grow and develop; and likely, if it’s a good place that has shown its willingness to invest in their career, they’ll want to stay and grow and keep making it better. What’s more they’ll want to remain in the profession, instead of leaving feeling tired, microaggressed, and demoralized. You take on white people without the requisite experience and keep them and train them all the time. I’ve seen it. You could keep us. So why don’t you? I’ll tell you. It’s because many of you and your institutions aren’t serious about diversifying the racial and ethnic homogeneity of our profession. You aren’t serious about dismantling whiteness in your institution and in our profession for good. You’re happy to have POC visit your institutional and professional neighborhoods, but you’re not ready to have us move in. You’re just not ready. We, as a profession, need to be brutally honest about this. We need to stop dancing around these coy discussions about early career experience and shifting budgets and confront the true nature of these temporary solutions we uphold. The whiteness of our profession is a problem that is persistently and historically entrenched. We need to get to the root and develop persistent, permanent solutions. Hiring us, supporting us, and keeping us isn’t the only answer. But it’s a good place to start. Mama. Daddy. Aunt Doll. Granny. Muz. Big. Aunt Pearl. Sutta. All my ancestors, all the way back, have always told me, “Don’t you never sign NOTHING a white man gives you without reading it first.” As a Black woman, I hold this advice dear. As a lawyer, I hold this advice dear. Before the first of the six figures of my law school loans hit my Sallie Mae account, I knew this basic tenet of legal practice. But I didn’t do it. I slipped one time. And now this. I’m on ALA Council. It’s a pain and a lot of work, but I do it anyway because the American Library Association is a big opaque beast (though one that has shown it doesn’t care much about the marginalized) and those of us with anti-oppression principles and financial privilege need to do what we can. When the ALA Office of Intellectual Freedom, which is led by a privileged white man, sent a draft of this interpretation out around May, I read it carefully and commented. I was frustrated that they were doing it. I knew it grew from misguided interpretations of the tiresome “Nazis in the library” question. The endless debate about free speech that is really by and for and about straight, cis, Christian, white men. But I was heartened to see comments and edits incorporated that seemed a reasonable (if not altogether desirable) compromise that most of us could live with. The statement I read and commented on, all the way up until ALA Annual in late June, had no specific mention of hate speech or hate groups. It just reiterated that generally people can’t be turned away from public library spaces for their beliefs. And there was at least one line about none of this having anything to do with regulating behavior to maintain safety. I figured it was the best we could do. And I trusted that the document with the final resolved comments and edits would be the document I’d vote on during the hectic frenzy that is ALA Annual. 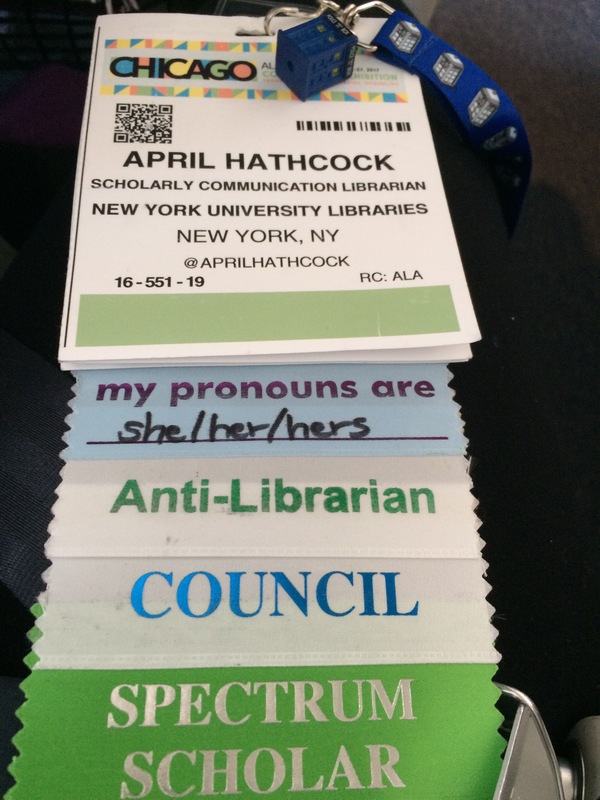 I thought I’d done justice to my office as an ALA Councillor and to my status as an ALA member who cares about anti-oppression and who knows libraries are not now and never have been neutral. I thought I could trust my colleagues in the ALA OIF, though led by a privileged white man, to be upfront and honest and not make any additional changes to the document that had been vetted and commented and edited by the membership for close to two months. I thought that, at the very least, last minute changes wouldn’t take place during a historically poorly attended and poorly advertised side session of Council. I thought any changes that did take place would be highlighted right before the vote and opened for discussion as is usually the process. In short, I thought I could vote on the document during the ALA Council Session, which always runs at a frenetic pace, without having to re-read it. Oh, ancestors, I should have heeded your time-honored advice. I’m sorry. I’m sorry I didn’t take the time—even spoken up to stop Council proceedings (which we totally can do)—to re-read this document and notice the change. I’m sorry that I voted for a document (essentially signed my name to a document) that I wholeheartedly do not support and cannot endorse. I’m sorry that library workers, whether they’re ALA members or not, who count on me to represent them were failed in this way. I’m sorry I didn’t listen to my ancestors. And I’m angry. I’m angry this new document was, I’m convinced, deliberately slipped past me and others who would have vehemently opposed it beforehand. I’m angry that my fellow socially conscious, anti-oppression Councillors—folks who are conscientious and thoughtful and who really care about this work—have been bending over backward to take responsibility and apologize and make things right while the bad-faith actors have glibly dismissed the concerns of their colleagues. I’m angry that other socially conscious, anti-oppression library workers who have already put in plenty of labor in this profession have had to step up to mobilize a response. I’m angry that it is again and always the women of color and white women, queer folks, non-binary folks, disabled folks stepping up to save this profession from itself. During this same ALA Annual, ALA Council voted to pass a resolution honoring the African-Americans who fought against the segregation of public libraries during Jim Crow. Like the First Amendment guarantee of free speech, Jim Crow was also THE LAW. But these brave librarians put their bodies, lives, and livelihoods on the the line to fight for what they knew was right, regardless of what an unjust law said. Though that’s all moot, because it is my expert legal opinion that ALA OIF purposefully mis- and over-interprets the law surrounding free speech. I just point it out because it is so typical of the hypocritical whiteness of the library profession. Anyway, for those of you who want to help do something, several of our amazing colleagues have put together letter templates. Please continue to write and call. The folks of privilege and power in our profession have been trying to dismiss our response as “a few posts on Facebook,” but we won’t let them ignore us. I came across this piece about a collection of Timucua language imprints that had been digitized by the New York Historical Society. It piqued my interest in particular because the Timucua were an indigenous nation in what is now known by us settlers as central Florida, my home. Title page from a Franciscan catechism written in Castellan and Timucua. Courtesy of the New York Historical Society. The piece itself is interesting in that it talks about the historical and linguistic importance of these imprints—how they represent the only remaining evidence of a rich native language that is thought to be an isolate, i.e., a language not related to any other language. The piece traces the story of how these imprints came to be housed in New York and how they came to be digitized. All very neat stuff. What the piece fails to acknowledge is the fact that the reason these imprints are the only things left of the Timucua language, and much of the culture, is because of the white European religious settlers who invaded the area. Indeed, this entire collection of imprints consists of Catholic religious documents that were created in both Spanish and Timucua in an undoubted attempt to force the Timucua to assimilate on pain of death. Nowhere in this piece are these historical facts laid bare. Nowhere is there a critical reflection on what it means that the only remaining evidence of a people’s language are translations of books representing the religion of their invaders and oppressors. As information professionals—librarians, archivists, curators, digitizers, whatever—we have a responsibility to bring a critical lens to every instance of our work. We cannot erase difficult or oppressive histories from the materials we collect and preserve. We should not hide them. There is no neutrality in that kind of whitewashing of history, only more oppression. I don’t fault the writer of this NYHS piece. They were just “doing their job” like so many of us do. But I do challenge this person and all of us to take more care in how we contextualize the materials we work with. Let us be careful not to perpetuate the oppressive power structures already represented in those materials. We can best do that by criticalizing our work whenever and wherever we can. It’s true. We take people from marginalized backgrounds and shove them into the meat grinder we call a pipeline. We churn them up in diversity residencies and diversity temp hires and diversity programs and diversity trainings. And then we spew out little white-sized (no, that’s not a typo) chunks for our organizations. We tell them to be people of color but not too much color. Be disabled but not too disabled. Be native but not too native. Be queer but not too queer. Be poor and working class but not too poor, not too working class. Just be a good little chunk with just enough quirk to make our organizational diversity look good. Finally, we congratulate ourselves on how diverse we’re making our professional sausage, with no regard to the identities and backgrounds these folks held before they entered our grinding pipeline machine. No wonder so many of our most talented leave the profession after a short while. We assume that assimilating folks from marginalized backgrounds into our professional sausage is enough. We don’t work on our inclusionary practices or organizational cultures. We don’t work on providing systemic, long-term professional and personal development support. We don’t work on changing the ways we think about and treat people historically oppressed people in our workplaces. All of that is just way too hard. So meat grinder, it is. I’m sick of the meat grinder mentality. We’ve got to do better. Many of us are starting to make those changes in our organizations from recruitment to staffing and leadership training. But we gotta do more. We’ve gotta do so much more. That’s it. End of blog post. I’m not giving you any solutions here because quite frankly I (and many others) have done that already in other places. (Hello, click on all the links I put in this post for a start.) But also I’m not doing it because that’s not my job. This black woman is not here to save you. Save yourselves. Do the work. Go.